Super Savings Item! 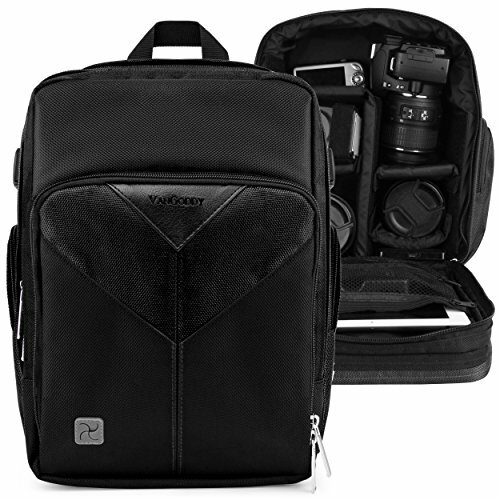 Save 34% on the VanGoddy Sparta Black DSLR & Mirrorless Camera Backpack Suitable for Canon EOS Rebel SL1/SL2/T5/T6/T7/T5i/T6i/T6s/T7i/EOS-1D X/X Mark II by Vangoddy at Pear Farm. MPN: ISVGCAMLEA726_B7. Hurry! Limited time offer. Offer valid only while supplies last. The VanGoddy Sparta is a direct representation of what a qualified camera backpack should be; lightweight, durable, but most importantly, practical. The VanGoddy Sparta is a direct representation of what a qualified camera backpack should be; lightweight, durable, but most importantly, practical. This protective camera backpack features a water and weather resistant Nylon exterior to effectively protect your camera and accessories from unwanted damage. The exterior also offers 2 zippered pockets, one on each side, ideal for quick access to desired items and accessories. The Sparta features 3 interior zones; the first is a small accessory pocket with a dedicated cell phone compartment with audio port opening for headphones. The second compartment features 2 zippered mesh pockets ideal for keeping loose cables composed and secure, also featured in this space is a dedicated tablet compartment that is completely padded and measures 12" X 8" X 2inches. The final compartment is the most crucial being the camera and lens compartment; this compartment features interchangeable padded walls and dividers to ultimately conform to your needs. Whether it is a full day of photo shoots or a simple public outing, rest assured this bag can effortlessly store all of your lenses and equipment. Our backpack shoulder straps are double padded and feature breathable mesh lining that can be worn for hours with no discomfort. 3 interior zones; First zone features small zippered storage compartment with cell phone slot and audio port opening | Second compartment offers 2 zippered mesh pockets for storing loose cables and a dedicated tablet compartment that measures 12" x 8" x 2"
Exterior measurements- 12.5" x 9" x 6.5" | Customizable interior measures: 12" x 8.5" x 5.5"